You've found the “U.S. 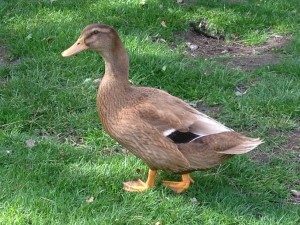 Buff Duck Breeders” page here at Hobby Farm Wisdom! If this is the first time you have visited our site: Welcome! The Buff Duck was developed as a multipurpose bird, with the ability to lay good quantities of eggs along with having the size and feather color to make a good roasting duck. They typically lay about 150-220 eggs per year, and it gains weight relatively rapidly. The Buff is a medium-weight duck between 7 - 8 lbs. It is a long, broad bird with an oval head, medium length bill, and a long, gracefully curved neck. Its wings are short and it has a small, well-curled tail. Both the male and the female have buff plumage, orange-yellow shanks and feet, and brown eyes. The drake’s bill is yellow while the duck’s bill is brown-orange.